The following are the 2018-2020 Sault Blues Society Executive for a 2 year term. These are as a result of our June 2018 AGM. Every Wednesday - Live Blues Night at the Water Tower Pub, 8:30 pm. see poster below. ​Every Thursday - Jam with MOJO at Reggie's West on Korah Road - 8-11pm -country, blues, rock, r&b, see poster below. For a list of all types of musical events go to Sault Music News Letter on facebook. You can request their weekly emails. Saturday May 25th Room 21- 11PM -- Catherine Taddo upstairs 480 Albert Street West SSM (above Low and Slow)Join Catherine and Lindsay Pugh for an evening of music, in an intimate setting at Room 21, above Low and Slow. Ray Fuller and the Bluesrockers. 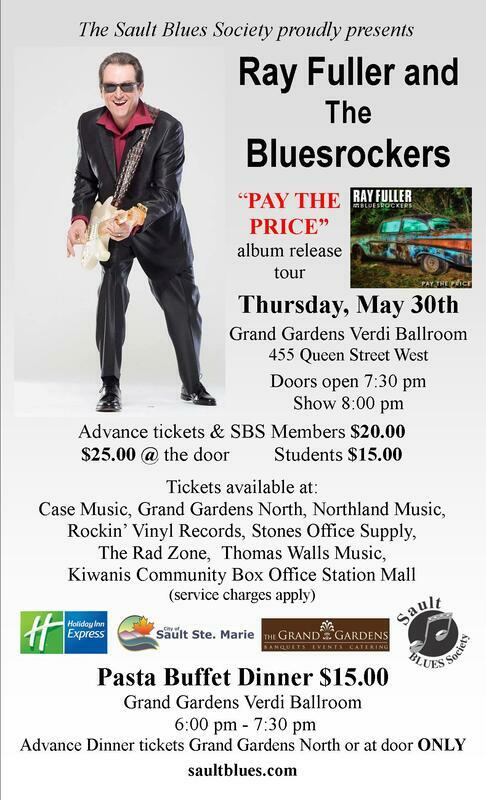 Tickets for the Sault Blues Society's presentation of Ray Fuller and the Bluesrockers LISTEN HERE are available at all outlets as of Monday April 1st for $20.00 advanced and $15.00 student!! VIP tables of 10 are also available from Johnnie Tibbles ONLY for $230.00 ($23.00 each). These 9 tables of premium unobstructed seating directly in front of the stage are reserved with your name on them. These 9 VIP tables always sell out. AS OF FRIDAY APRIL 5th THERE ARE ONLY 2 VIP TABLES REMAINING!!!! Get them before they are gone. Ray Fuller and the Bluesrockers will be playing for the South Canada Blues Society in Windsor on Wednesday May 29th, the Sault Blues Society on Thursday May 30th and the Thunder Bay Blues Society on Friday May 31st. This is joint effort between the 3 Ontario Blues Societies, thanks for supporting our Blues Societies!! The Verdi will also be serving a delicious Pasta dinner consisting of pasta, sauce, meatballs, salad, bread, desert, tea and coffee prior to the show. Doors for the dinner open at 6pm and dinner will be available until 7:15. Pasta dinner is $15.00 with tickets available ONLY at the door and Grand Gardens North. Presented by the Sault Blues Society. Support our sponsors: Click on each icon to view their website.